It has been said that Sigmund Freud used to take his dog into sessions to encourage trust. But no matter how perceptive the father of psychoanalysis was, he probably didn't anticipate the use of animals in social work practice. More social workers are finding that animals are good assistants in the therapeutic process. Veterinary social work is a growing field. Additionally, social workers are being called upon to work in settings where animals and people are in crisis. The beneficial effects of animal-assisted therapy (AAT) have been recognized since 1945, when therapy dogs were first trained to provide comfort and motivation to injured World War II soldiers. Service dogs have been reported to help people experiencing post-traumatic stress disorder with patience and better impulse and emotional control. Animal-assisted therapy can mean many things. Social workers, counselors, and therapists may include animals to aid in a psychotherapy session. Cats, goats, rabbits, ferrets, guinea pigs, and even rats have been used, but dogs are the most common. Animals are sometimes taken into hospitals and hospices to lift people's spirits. 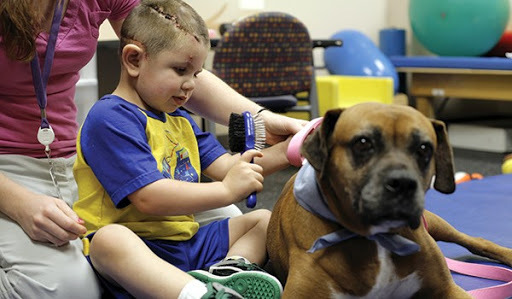 In a program like Therapy Dogs International, many of the children chosen to participate have difficulties reading and resulting self-esteem issues. They are often self-conscious in front of other classmates. But in front of a dog, the child relaxes, pats the attentive dog, and focuses on the reading. Still other reading programs use dogs-usually golden retrievers-in libraries. AAT can be beneficial with patients suffering from acute symptoms of disorders such as schizophrenia, personality disorders, and anxiety; in hospices to improve the quality of end-of-life care for patients; and in work with children with disabilities. It can alleviate pain in youngsters and decrease loneliness in older adult patients. Animal-assisted interventions also can be a useful tool for social workers to teach socialization skills, combat bullying, and enhance physical health, among other therapeutic goals. Golden retrievers were sent to provide comfort after Hurricane Sandy, the shooting at Sandy Hook Elementary School, and 9/11. But animal-assisted therapy is more. "Even the most highly trained dog is still a dog and doesn't necessarily have the ability to pull off a therapeutic intervention," says Philip Tedeschi, MSSW, LCSW-CO, executive director and co-founder of the Institute for Human-Animal Connection at the University of Denver's Graduate School of Social Work, where he also is a clinical professor. The animal essentially acts as a go-between to foster a relationship between a social worker and a client, which promotes comfort and a sense of safety to expedite the therapeutic response. "Animals can often be a valuable bridge back to establishing a human relationship," Tedeschi says. The Animal-Assisted Social Work Certificate offered by the University of Denver is the first of its kind in the United States. It explores the therapeutic use of animals in many types of social work practice. The nation's biomedical facility, National Institutes of Health, has sponsored a canine-assisted animal therapy program since 1989. Once a week, therapy dogs accompanied by their owners visit patients with life-threatening illnesses, says Ann Berger, M.D., chief of pain and palliative care at NIH's Clinical Center. Patients who are "imminently dying" are permitted visits from their own pets. "Animal-assisted therapy makes a huge difference for a lot of patients," says Berger. "It's part of a larger program to normalize life for and add to the quality of the life of patients." The Children's Inn at NIH, a residence for children undergoing treatment for life-threatening illnesses at the NIH, also has a therapy dog. "Our mission is to reduce stress and promote healing," says Jennie Lucca, MSW, CEO. "While NIH is taking care of the children's medical needs, we're taking care of their heart, soul, and spirit. A real therapy dog is a real benefit to residents." Animal-assisted interventions are increasingly used with veterans. The Warrior Canine Connection piloted in 2008 at the Palo Alto Veterans Administration and has spread. "It's meant to be two things," says Rick Yount, MS, LSW, executive director of the program in Brookeville, MD. "Training a service dog for a fellow Veteran with physical disabilities provides a valuable opportunity for a Warrior suffering from psychological injuries such as PTSD to reintegrate into civilian life." As part of their training, Warriors have the responsibility to teach the dogs that the world is a safe place. In doing so, they must convince themselves of the same. Warriors participating in the program have reported that employing positive emotions to praise their dogs has significantly improved their family dynamics. The Warrior Canine Connection uses Labradors and golden retrievers bred for service dog work. "Professional trainers work with the vets," says Yount. Moreover, the vets volunteer to participate. "We explain what the dog is being trained to do and who it's for," Yount adds. "The vets are not going to say no to a fellow vet, even though it's not easy training the dogs-who will be doing such difficult tasks as opening a refrigerator or riding the Metro with a disabled vet." Human beings have long had a love affair with horses. Maryland Therapeutic Riding (MTR), located on a 26-acre farm in Crownsville, MD, is one of many programs that tap into their "therapeutic power," says Kelly Rodgers, program director. MTR seeks to improve quality of life and conquer physical, developmental, and emotional health challenges-such as cerebral palsy, spina bifida, ADHD, neuromuscular disorders, post-traumatic brain injury, autism, and cognitive disorders. Riders experience improved self-confidence, strength, balance, coordination, attention span, and social skills. In the therapeutic riding component, instructors use the horse as a tool to teach riding skills and reach the rider's individualized goals, such as increased self-esteem. Hippotherapy refers to treatment aided by a horse in a structured, one-on-one therapy session under the guidance of an occupational, physical, or speech therapist. Hippotherapy is used with people experiencing PTSD, depression, or anxiety, as well as for physical disabilities and people on the autism spectrum.